Through thirty-five games, the Red Sox were officially one game off of last season’s pace. The offense, as anticipated, is fine. The loss of a 2011 MVP runners up didn’t help, but we’re fourth in OPS, fourth in slugging, fifth in OBP and second in runs scored. Just as with last September, the problem so far is pitching – this last solid turn through the rotation notwithstanding. Only six teams in baseball have gotten fewer innings from their starters, and only the Royals are walking more per nine. Which might be acceptable if the starters were striking people out right and left, but that’s not the case either: we’re 26th in K/9. All of which adds up to a starters ERA of 5.46 (second worst in baseball) and an xFIP of 4.45 (third worst). If you’re looking for an explanation, then, as to why the Red Sox find themselves in the AL East basement, there it is. It’s true, as the excellent Alex Speier documents, that Valentine’s decision making with his pitchers has been questionable, and that the poor numbers above may be exaggerated by this. But even if we were to give the pitchers the benefit of the doubt regarding usage, at best they might approach middle of the pack. The simple fact is that the pitching has been bad. Which is why most of the Red Sox reporters have been inclined to give Bobby V a pass thus far. The team’s performance is not his fault, they argue – it’s the starting pitching. And they’re correct to do so, because the truth is that as much as I believe Valentine is the wrong manager for the Boston Red Sox, our record to date is not his responsibility. But here’s the catch, if you’re a reporter. 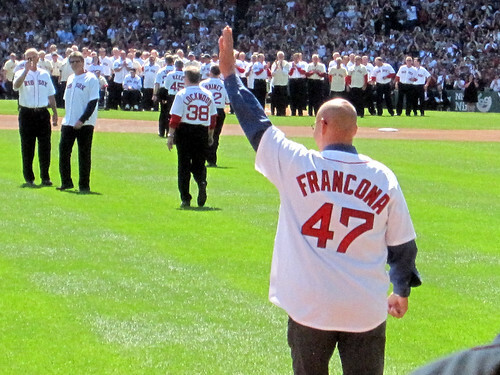 If you take this position – and it is, in my opinion, the correct position – you cannot simultaneously hold Francona responsible for the Red Sox failure last September. You know where the Red Sox starters ranked last September in ERA? Dead last, with a horrific 7.08. The next worst rotation? Baltimore, at 6.09: almost a full run better. How about innings pitched by starters in September? Second to last. Pittsburgh’s rotation pitched one fewer game than we did and thereby eked out the fewest starters innings title. Pick your metric, and the starters were awful. They had the worst BB/9 and the third worst HR/9. The Indians starters were the only ones to allow more runs than the Red Sox rotation in September; which would damn them if they hadn’t pitched thirty one and two thirds more innings than our guys. The average hitter against last September’s rotation put up a .300/.386/.489 line for an .875 OPS. Which meant, effectively, that the average hitter was performing a bit better than Adrian Beltre, Mike Napoli or Miguel Cabrera have so far this year. If you were ever curious as to how you go 7-20 in a month, those numbers are a good place to start. Also, throwing poor, obviously not ready Kyle Weiland every fifth day. But what’s the point of all of this? It’s simple. Reporters, you can pick one of the following: a) the 2012 slow start is not Bobby Valentine’s fault or b.) the September 2011 collapse was Tito Francona’s fault. Last I checked, it’s still a free country, so you’re entitled to choose either one of those options, even if one of them is laughably absurd. You cannot assert that both are correct, however. Throwing one the book at one man without even charging another for the same offense is just too much, even for a profession with a notoriously casual relationship with the facts.